Follow this tour through the glorious Burgundy countryside to stay in château hotels, wander through their stately rooms, parks and gardens, and taste some of the best French wines produced on the noble estates. If you’re coming from the UK by train, take Eurostar to Paris Gare du Nord, then transfer to Gare de Lyon on RER line D, destination: Corbeil Essones, Melun, Malesherbes. Take the train to Dijon (from 1 hr 41 mins) where you can pick up a hire car. From Dijon, it’s 1 hr 35 mins (130 kms/75 mile) to your first stop. If you are driving from Paris, it takes around 3 hours 25 minutes (315 kms/195 miles). Check out the various ways to get to Burgundy by car, taking the DFDS ferry either from Dover to Calais or Newhaven to Dieppe. Check out the ferry routes here. The gracious neo-classical Ancy le Franc Château is something of an oddity. This spectacular white stone building of the French Renaissance is more Italianate than French and it has some of the finest apartments built for a king in the whole of France… but it's in the middle of nowhere. The Clermont-Tonnere family who built and embellished the château were ambitious; this was the way to impress your king (if he should ever come visiting), and to remind anybody passing of your wealth and power. The exterior is magnificent, but the internal symmetrical courtyard is jaw-droppingly impressive. Walk up to the first floor and a series of beautifully decorated rooms: the elaborately decorated chapel; the Chambre des Arts with its original wooden panels and ceiling divided into stuccoed panels of extraordinary intricacy; the splendid King’s apartments and the delightful and intimate Chambre des Fleurs where wood panels decorated with exotic flowers stand out against a background of gold leaf. The library held 3,500 books; the Louvois lounge was originally used by Louis XIV in 1674; the 200-square-meter Guard’s Hall, designed for King Henri III who never came, nearly bankrupted the family. There are tiled floors, parquet floors, paintings from the Flemish and Italian schools, and huge murals in the Galerie de Pharsale depicting the horrors of war. The proportions are perfect; light floods in from the long windows looking out onto the gardens, formal French with strictly delineated flowerbeds on one side and an English garden with mature trees, green lawns and still water on the other. The château runs a series of events during the summer with concerts and spectacles like a formal dance with actors dressed up in period costume. From Ancy le Franc to Vault de Lugny is a short 45 mins (55 kms/34 miles) drive. The five-star Château de Vault de Lugny looks the part: a warm stone building with pitched rooves set in rolling parkland. A moat surrounds part of the property, reflecting the round 13th-century tower with small windows that once housed a dungeon. The ground floor entrance area, with a bar to one side, is relatively modest and gives little idea of the splendid bedrooms. The Chambre du Roy (King’s Chamber) is suitably grand with a high ceiling, polished old wooden floor, four-poster bed, and a fireplace where a fire crackles on winter evenings. The Chambre de la Reine (Queen’s Room) is softer in style with pretty wallpaper and soft lights, and a half-tester bed. Other rooms offer the kind of French luxury you see in posh lifestyle magazines, with all the comforts of 21st century living on offer in the generous bathrooms. The restaurant is downstairs in a vaulted room with a baronnial-sized open fireplace at one end. You’re in the former 17th-century kitchen but there’s nothing old-fashioned about the cooking. Using fresh produce from the walled kitchen garden, and top, seasonal French meat and fish, the chef’s light touch produces dishes like Brittany lobster with chorizo, and Charolais beef with black truffle purée. Cheeses are served in perfect condition; desserts are rich without being heavy. In summer you can dine on the terrace or under the trees in the park, watching the sun slowly set while drinking great Burgundy wines. The hotel runs wine-tasting expeditions, cookery classes and outdoor activities which range from fishing in the river to hot air ballooning; from horseback riding to rafting. And if you just want to laze around the château, you can use the stone vaulted swimming pool, which is also available for private dinners. If you do that, buy the love box, perfect for St Valentine's Day. A beautiful morning drive (1 hr 20 mins, 86 kms/54 miles) takes you through the hilly Regional Park of the Morvan, beside the Burgundy canal and past formidable castles and fortified manor houses to the Château de Sully where the family history is as intriguing as the château is beautiful. The white building stands four square. Stables of an admirable symmetry march down on two sides from the house, separated by lawns and flower beds, and a moat. The château stands on a Roman site, and went through the changing fortunes that befell so many castles in a region which opposed the French King. What you see today dates mainly from the 16th century when the Saulx Tavannes family, who were supporters of the King, lavished a fortune on the château and the estate. But life in Louis XIV’s court was an expensive business, the family over-reached themselves and the building was put up for sale in 1715 and passed to the Morey family. So far, so very French. But now… enter an Irish family, the Mac Mahons in the form of Jean-Baptiste de MacMahon, a doctor in Autun who married into the Morey family and very successfully managed the château and estate. The present owner, Amelie, married the 9th Marquis de MacMahon, 4th Duke de Magenta in 1990. A formidable Scotswomen with a wicked sense of humor, she lives here all year round, managing the house and the nearby wine estate at nearby Chassagne-Montrachet and Puligny-Montrachet, along with her sister, Charlotte. Enter through the huge wooden doorway and you’re in a beautiful Renaissance courtyard. One side of the château is open to visitors, allowing you to stroll through elegant and spacious rooms with wooden floors, panelling, marble fireplaces, priceless furniture and paintings and photographs of the British royal family. There’s a macabre collection of stuffed animals, including a huge boa constrictor that lies sinuously along the top of a fireplace. Don’t worry; they were all shot or otherwise disposed of decades ago by long-dead ancestors. The château is particularly good for families with special trails that children can follow (sweets are scattered around in bowls to encourage them). And even if your lot doesn’t speak French, don't worry. They can easily follow the costumed actor/animator who leads them through the stories of the past and the château. They can even dress up as they follow the trail of the Princess or enjoy a season treat at Easter. From the château de Sully to the Château de Couches takes a mere 25 minutes (23 km/14.5 miles). Eat lunch here from the excellent plate of specialties from the region at €16 (check out the excellent local Morteau sausage from the Jura mountains). You must book this in advance but it’s well worth the trouble. Fortified, now you can climb the tower of the medieval Castle of Marguerite de Bourgogne. The château was vital to the Dukes of Burgundy, protecting the route from Paris to Chalons. The walls of the tower are thick; the huge fireplaces provided warmth; beautiful, 17th-century Aubusson tapestries keep the warmth in. In the dining room two cupboards in the wall kept the implements for the meal; one for the guests, and a second for the lord's utensils locked so no would-be poisoner could get at them. The steps down into the underground galleries are uneven and you have to watch for low beams. Under attack and in the dark, the canny defenders of the castle counted the steps before reaching the forehead-cracking beam; invaders were stunned. Life as a soldier in the Middle Ages was not a comfortable one. Try on the chain mail headpiece and helmet, full body armor and immensely heavy sword or axe, and imagine running around in all that, attempting to hack your enemies to pieces. The privately owned château stands apart from the village and looks over the Creuse river. Make sure you walk through the well-stocked garden, reached through a massive gateway. There are special events and wine tastings from their own Château de Couches vineyard. If you want to stay, book one of their chic bed and breakfast rooms. They are €190 per room per night, and include breakfast, guided tour of the château and a wine tasting. There’s time for one more château today. It’s just a short 25-minute drive (18.2 kms/11.5miles) south east towards Chalon-sur-Saône to reach the château de Germolles. 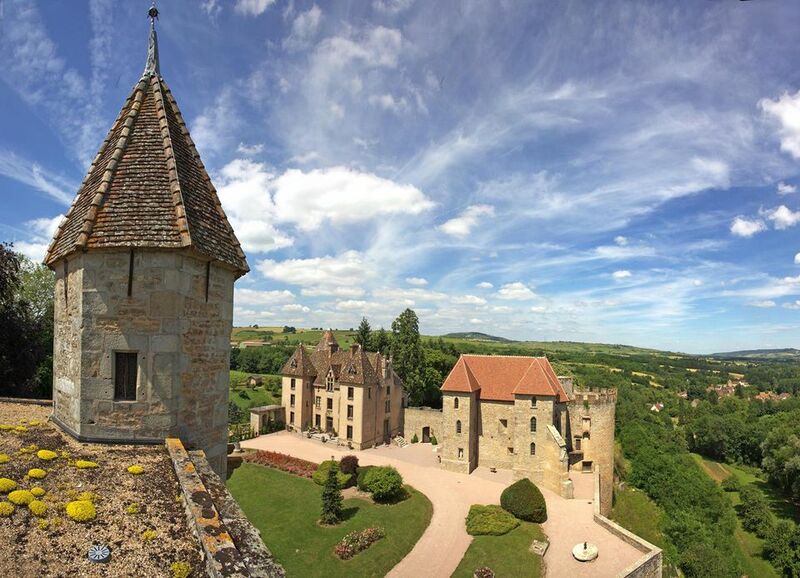 Originally built in the 14th century, this is the only well preserved castle of the Dukes of Burgundy left from their fantastic wealth of buildings: they had 50 châteaux in the region, including 20 palaces. Its heyday was during the time of Margaret of Flanders, a fabulously wealthy heiress who owned much of northern France. In 1380 with her husband, Philip the Bold, Duke of Burgundy, she turned her attention to Germolles, making it the playground of the ducal court and welcoming the King Charles V in 1389. Walk down into the vast crypt where round windows and a vaulted ceiling reveal its 13th- and 14th-century origins. Out in the open take the steps up to the passageway running above the entrance and into what was once the imposing royal chapel. It had a separate oratory for private prayer, arrow slits to protect from the enemy, and an astronomical clock which was state-of-the-art technology in the 14th century. The château itself hides its 14th-century origins behind a pretty façade. Inside it’s a mix of periods and styles, with kitchens and high-ceilinged rooms with Renaissance fireplaces, wooden floors and stately furniture, and some comfortable 19th-century rooms. But it’s the small medieval apartments of Philip and Margaret that are the most striking. Margaret had the rooms decorated with the gothic script letters of ‘M’ and ‘P’ and the thistle, a plant which denotes fidelity and respect. At a time when courtly love, and symbolism, were so important, this was her gift to her husband. Despite the fact that the green is faded and the figures are now black instead of the original shining gold, these are particularly moving rooms bringing whispers of the past alive. It’s a short drive to your hotel, the Château Saint-Michel, taking around 15 minutes (8.5 kms/5 miles). The red brick and stone château dominates the surrounding little town, but this is a Relais du Silence and it lives up to its name. The hotel has been recently bought by a Dutch couple who have great plans for this four-star hotel, concentrating particularly on top wines matching the meals. If you can, ask for a quick tour which takes you down to spacious cellars stretching the length of the building, and into the ornate chapel built by the very catholic first owner. Rooms are large and decorated with antiques; bathrooms are impeccable. There’s a dining room opening onto a terrace for breakfast and if there’s a special occasion (and I urge you to make one!) you can dine upstairs in a very grand room. Château d’Arlay is a 75-minute drive (73 kms/45 miles) into the Jura mountains of eastern France that is part of the Burgundy-Franche-Comté Region. The original 9th-century castle stands at the top of the hill running up from the main estate but you don’t see the romantic ruins until you emerge from the forest paths at the summit. It’s a lovely walk up there, past outbuildings where goats shelter on windowsills from the rain, an open-air theatre, leafy glades, the boulingrin (from the English ‘bowling green’), and ancient walls. This hidden castle seems a long way from its heyday when it belonged to the Orange Principality of the Netherlands. The royal connection remains today: the King of the Netherlands is still known as the Prince of Orange and Baron van Arlay. The present family owners live in a delightful 18th century house, once a convent of the Minimes order. You can visit half of the house, and it’s worth taking the guided tour as this delightful mansion is full of oddities that beg for explanations. There’s a stove apparently marooned in the middle of the oval library: its chimneys are concealed behind two false book cases. And those giraffes in the form of decorated plates and a special bed are baffling until you know the story of the giraffe gifts of Mehmet Ali, Sultan of Egypt to three European monarchs in 1826. No giraffe had been seen in Europe for three centuries and the ‘Beautiful Animal of the French King’ became all the rage. She arrived in Marseille by ship, her head poking above the cargo through a specially cut hole, and began the 900km-walk through France to Paris, fitted out with a yellow coat and special shoes. Feted and admired in every town she passed through, she started a craze for giraffe designs. Not every artist saw the animal; some relied on local descriptions and the depictions are charming and hilarious on the china in the château. You can taste and buy wines from the château’s vineyards that you see on the surrounding hills. This is possibly the oldest vineyard in France, dating back to 1070. From here, drive to Nevy-sur-Seille for lunch at the delightful Café Chez Janine (15 minutes; 9.3 kms/5.5 miles away) which has been in the same family for three generations. With a décor that can only be described as eclectic, this is the place for another excellent plate of local delicacies. If you have time, drive to Château-Chalon, one of the most beautiful villages of France, to visit the Maison de la Haute-Seille and a tasting of Jura wines (12 minutes; 7kms/4.5 miles). This afternoon, drive to Besançon, the capital of the region. This underrated town is delightful, dominated by the extraordinary 17th-century citadel built by Vauban, the genius behind King Louis XIV’s defensive buildings. Take the rest of the afternoon to visit this great castle. Walk along the ramparts looking out over the river; wander through the different museums that include a thoroughly domestic picture of past life in the region, the story of Vauban and his fortifications (he was a very busy engineer), and a chilling look at the rise of Hitler, the Resistance in France and the deportations. On a lighter note, there’s lots for families. The Insectarium has one of the largest collections of anthropods and insects on the planet. The Noctarium gives you an insight into the mysterious world of night mammals; there’s an Aquarium about the local river, the Doubs, a Zoo and a farm. Stay the night just outside Besançon at the Château de la Dame Blanche, a 30-minute (24 kms/15 mile) drive. It’s a large estate with a red brick chateau housing the public areas and bedrooms themed around different cities. Two adjacent buildings house comfortable rooms, again themed around countries. There’s an excellent restaurant and a relaxed atmosphere. There's time for one nearby château before going back either to Besançon or to Paris. Standing high above the trade route that existed since Roman times from Italy to the Jura, Burgundy, Champagne and Flanders, the Château de Joux fortress has a formidable position, made even more invincible by Vauban in the 17th century. Walk up past different defensive walls and you see how easily defended the site is. The walls are grey stone; passages are narrow; courtyards are small and there’s plenty of armour and weaponry. It was used as a prison during the French Revolution, but had its fair share of tragic incarcerations throughout its history. The most poignant story is about Toussaint Louverture, a slave from the island of Saint-Domingue (present day Haiti) who led a slave revolt in 1791, and became the first black general in the French army, and governor of Saint-Domingue after slavery was formally abolished. But the story does not end well: Napoleon sent a military expedition to the island to re-establish slavery and to capture Toussaint. He was brought back to France, imprisoned in the Chateau de Joux and died here in 1803. Those with enough stamina should take the long stairway down to the well where the guide drops water into the well. It takes 12 to 15 seconds to reach the bottom. It’s an ideal place to visit with children; scary enough to impress but not terrify.